Imagination Technologies, whose shares trade on the FTSE 250, lost 70% of its market value at one stage on 3 April when the world's most valuable listed company announced plans to stop buying Imagination's processing products and make its own alternatives. At the time, Apple was its largest customer - accounting for around half its annual revenue - and a major shareholder. 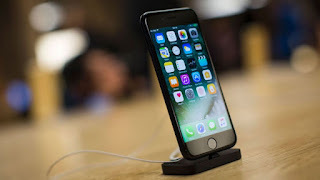 It prompted the Hertfordshire-based company to launch a dispute resolution procedure under its licence agreement with Apple to seek new licencing terms and royalties in a bid to avoid the prospect of a costly intellectual property battle in the courts. It later announced it was looking to sell its MIPS and Ensigma operations - focused on embedded processors and connectivity respectively. News of the group sale helped Imagination shares rally 19% on opening. The company said: "Imagination Technologies Group announces that over the last few weeks it has received interest from a number of parties for a potential acquisition of the whole group. "The board of Imagination has therefore decided to initiate a formal sale process for the group and is engaged in preliminary discussions with potential bidders. "The sale process for the MIPS and Ensigma operations, which commenced on 4 May 2017, is progressing well and indicative proposals have been received for both businesses." Neil Wilson, senior market analyst at ETX Capital, said buyers were keen as Imagination's shares remained 60% down on where they were before the Apple row ahead of the market opening. He added: "It was never going to be easy for Imagination Technologies when it lost its biggest customer and efforts to offload two of its three main businesses - MIPS and Ensigma - in a bid to strengthen the balance sheet clearly weren't enough. "These were both strong potential growth areas that could have delivered lasting revenue accretion to offset the loss of Apple. "That was a pretty dire scenario, akin to selling off the family silver to keep the estate going a little longer. "Now the shutters are up and a buyer sought. A pretty ignominious end to what was a great British tech success story."